ww2dbaseAlton Glenn Miller was born on 1 March 1904 in Clarinda, Iowa, United States as the second of four children of Lewis Elmer and Mattie Lou Miller. The family regularly moved from state to state as the young Miller's father worked in various jobs, including as a carpenter, a janitor, a homesteader and a railway bridge foreman. Despite the Miller families somewhat nomadic existence they were by no means unhappy and enjoyed performing music together in the evenings. Alton Miller disliked his first name and always insisted on being addressed as Glenn. ww2dbaseIn 1923, Miller enrolled in the University of Colorado, but withdrew after a while to play the trombone with a number of dance bands. He settled in New York, New York, United States in 1928, arranging music for other bandmasters, and in March 1937 he made an unsuccessful attempt to form his own band. Friends persuaded him to try again a year later and by 1939 his distinctive form of music, based on the reed-section sound of a clarinet over saxophones, which came to be known as the "Glenn Miller sound", was achieving considerable popularity across America. The band was much in demand to perform in leading theatres and ballrooms. They broadcast on the radio from coast to coast, and also appeared in two Hollywood films (Sun Valley Serenade in 1941 and Orchestra Wives in 1942). ww2dbaseIn the autumn of 1942, when at the peak of his career, Miller joined the US Army and later transferred to the USAAF. At the age of 38 he was too old for a combat role, but he thought that he could best serve the troops by providing musical entertainment. At the instigation of Colonel Edward M. Kirby, he and his band were sent to Great Britain. Miller flew to England, United Kingdom on 18 June 1944 and his band of over sixty musicians and organisers, many of them top musicians who had been drafted into the armed forces, arrived at Gourock in the liner Queen Elizabeth (q.v.) ten days later. General Dwight Eisenhower, the Supreme Allied Commander in North-West Europe, had already seen the need to provide a radio station, the AEPF, to broadcast to the invasion forces, and Miller's band would play a key role in providing musical entertainment as one of the big bands which were the vogue of the day. ww2dbaseBased in Bedford, Bedfordshire, England, considered safer from the flying bombs which began to arrive over the British capital, the Glenn Miller band (later renamed as the American Band of the Allied Expeditionary Force) took on a heavy work schedule providing concerts to enthusiastic audiences at many army and air force bases. In addition they pre-recorded concerts for the BBC's Maurice Gorham which were produced by AEPFs Cecil Madden. A hard taskmaster, Miller was tall and broad-shouldered, and he wore rimless spectacles which accentuated his rather studious manner. His voice was easy and confident when he introduced the rich and melodious numbers for which his band had become popular in America. ww2dbaseMiller was eager for his band to actively support the troops fighting in northern France and promised that he would give a live performance in Paris, France over Christmas. When Paris was liberated on 23 August he was determined to make good his promise. When they heard of his plan both Gorham and Madden did their best to stop the band from going, but Miller was adamant. During November he flew to France and was invited to return with his band in the following month, to entertain the American troops for a six week period. Lieutenant Don Haynes (Miller's executive officer), flew to Paris to arrange accommodation for the band and, in mid-December, Miller received authority to proceed with the tour. In a marathon session of 18 days, the band recorded a total of 88 programmes at the Abbey Road studio, in addition to making 23 life regular broadcasts. These programmes were scheduled to be broadcast by the BBC during the band's absence. Miller decided to go ahead of the band to make the final arrangements, intending to fly from Bovingdon (US Air Station 112) near Hemel Hempstead. On 13 and 14 December, he waited in his London apartment for an aircraft, but foggy weather prevented any flights to France and so he returned to Bedford late on the 14 December. ww2dbaseThe next morning Miller was offered a flight by Lieutenant Colonel Norman F. Baessell, from the nearby base of Milton Ernest. Despite the weather still being foggy across much of southern England and the Midlands and the temperature being barely above freezing point at ground level, Baessell declared that he hoped the weather would have sufficiently improved by later in the morning to permit a take-off. Baessell frequently flew to Paris and on this day had been provided with a Noorduyn C-64A Norseman (serial No. 44-70285) belonging to US Air Station 547 at Abbots Ripton, the base of the 35th Depot Repair Squadron of the US Eighth Air Force's Service Command commanded by Brigadier General Donald Goodrich. The Norseman was to be flown by Flight Officer John R. S. "Nipper" Morgan, a US citizen who had been born on 14 June 1922 at Hamilton in Scotland, the son of a coal miner. Morgan's family had migrated to the USA and settled in Detroit, Michigan. He had volunteered for the RCAF in 1942 and had trained in Canada and England, before transferring to the USAAF in May 1943, with less than 500 hours in his pilot's log book. In the USAAF, Morgan, who had no operational experience, either in the RCAF or in the USAAF, was employed on liaison and ferrying work. According to one of his fellow pilots, he was competent at visual flying but not proficient at instrument flying or pilot-navigation. ww2dbaseThe ultimate destination of the Norseman was Bordeaux, with a stop at US Air Station A-42 at Villacoublay, south-west of Paris, which was an advanced air depot for the Ninth Air Force Service Command. Morgan was ordered to pick up Miller and Baessell at Twinwood Farm, an airfield three miles north of Bedford. At about lunchtime Morgan was given clearance from Abbots Ripton and took off for Twinwood Farm. Haynes, who had meanwhile driven Miller to Milton Ernest to have lunch with Baessell, then drove the two men the few miles to the airfield to await the arrival of the Norseman. The waiting men wondered if Morgan would be able to locate Twinwood Farm through the low cloud, but after a little while the Norseman appeared and landed safely. Miller it seems was a little reluctant to take off in such an aircraft and asked why there were no parachutes. Baessell, who was apparently a rather ribald character, laughed and replied with one of his favourite phrases: "Do you want to live forever?" According to the official report, the Norseman took off at 1355 hours, then disappeared and not a single message was received from it. ww2dbaseThe band was scheduled to fly to Paris from Bovingdon on the 16th but again fog prevented their departure and they returned to Bedford. Finally, on 18 December, three C-47 aircraft of the 315th Troop Carrier Group flew into Twinwood Farm to pick up the members of the band and fly them to Orly, near Paris. The men were somewhat surprised to find that Miller was not there to meet them or direct their activities. Lieutenant Haynes telephoned SHAEF Headquarters at Versailles, and was told that they knew nothing about Miller's arrival. He then telephoned Brigadier General Goodrich in England to learn that the aircraft had not landed at Villacoublay and was reported as missing. ww2dbaseMeanwhile, the recordings made by the band prior to Miller's disappearance continued to be broadcast; the listeners unaware that the famous band leader had lost his life. The USAAF did not announce Miller's disappearance until 24 Dec 1944. With sometimes dozens of aircraft being lost at this stage of the war, the USAAF did not waste time and resources searching for missing aircraft unless a dingy or parachute had been spotted. In any case survival rates of airmen brought down in the freezing Channel waters were notoriously low. The actual cause for the loss of Morgan's aircraft has never been fully established although a number of theories have been suggested over the years. These include engine failure, icing, or friendly fire (although why Morgan was unable to put out a Mayday signal remained a mystery). Another suggestion put forward by aviation historian, Roy Conyers Nesbit, was that the Norseman was brought down after straying into an area off France where RAF Lancaster aircraft from an aborted mission were jettisoning their incendiary and cookie bombs before turning for home. Whatever the cause of his disappearance tunes such as "In the Mood", "Moonlight Serenade" and "Chattanooga Choo Choo" made famous by this great bandleader have continued to live on and still remain popular today as a memory of the 1940s. 1 Mar 1904 Glenn Miller was born in Clarinda, Iowa, United States. 8 Oct 1942 Glenn Miller reported for military service at Omaha, Nebraska, United States. He was assigned to the Seventh Service Command as a captain in the Army Specialist Corps. 18 Jun 1944 Glenn Miller arrived in England, United Kingdom. 28 Jun 1944 Glenn Miler arrived in Gourock, Scotland, United Kingdom aboard the liner Queen Elizabeth. 15 Dec 1944 Noted American dance band leader Glenn Miller departed England, United Kingdom aboard a Noorduyn C-64A Norseman aircraft piloted by Flight Officer John R. S. "Nipper" Morgan for Villacoublay, France. The aircraft disappeared somewhere over the English Channel. 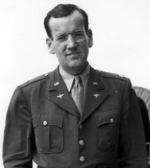 24 Dec 1944 The USAAF announced Glenn Miller's disappearance over the English Channel nine days prior.